We'd love for you to come see our alpacas. Ranch visits available seven days a week. Appointment preferred but not required. We love showing off our friendly hand-raised alpacas. Feed them carrots yourself. Ask a lot of questions. Be ready to fall in love. Expect to get your questions answered. We, like most alpaca owners, love sharing information about our animals. Never be afraid to ask anything. There are no dumb questions. Expect to feel luxurious fiber. You'll be impressed at the softness and warmth. Fleece is at it's longest in April, just prior to each year's shearing in late April or early May. Expect to dress casually. This is a farm and you'll be walking in grassy pastures or gravel walkways. Dress for fun. Expect to spend some time. You can stay for as short or as long a time as you like. 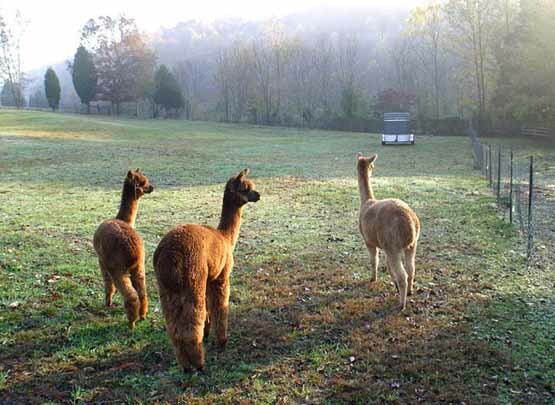 But if your experience is anything like ours, when we first started visiting alpaca farms and ranches we were mesmerized. Seems we never got out of there in less than 3 hours. Expect to enjoy yourself. The delightful personality of these animals will win you over. They're just fun to watch. Sometimes they make you laugh. They can even make you feel better about the world, about life. At the very least, you'll be leaving with a smile. There is something special about standing among grazing animals, just listening to the sounds of grass-munching. It has a calming effect on you. Or spend some time on our rockin' chair porch, just watching the animals play down below. It's very relaxing. C'mon over. You'll have a great time. Mmmmmmm, that's g-o-o-o-o-o-d . . .
Click here to return to the top of this page: Ranch Visits.